Now, a few days after the election on November 17, everyone is waiting for the National Electoral Commission (NEC) to announce the final results. Rumors of when NEC is going to announce the results spread like wildfire across Freetown, where people are eagerly anticipating the results. Whether via radio, tv or text messages each press conference by NEC is believed to be the big one, where the results will be called by NEC’s chairperson Christiana Thorpe. But so far everyone is still waiting. The incumbent government, APC (red), has over the last years achieved visible changes in Sierra Leone, which is why many voters are reluctant to vote for a different player that may or may not continue on the same path. With slogans like: “De Pa de work” (The President works) and “I will do more” APC is banking on their incumbency advantage. 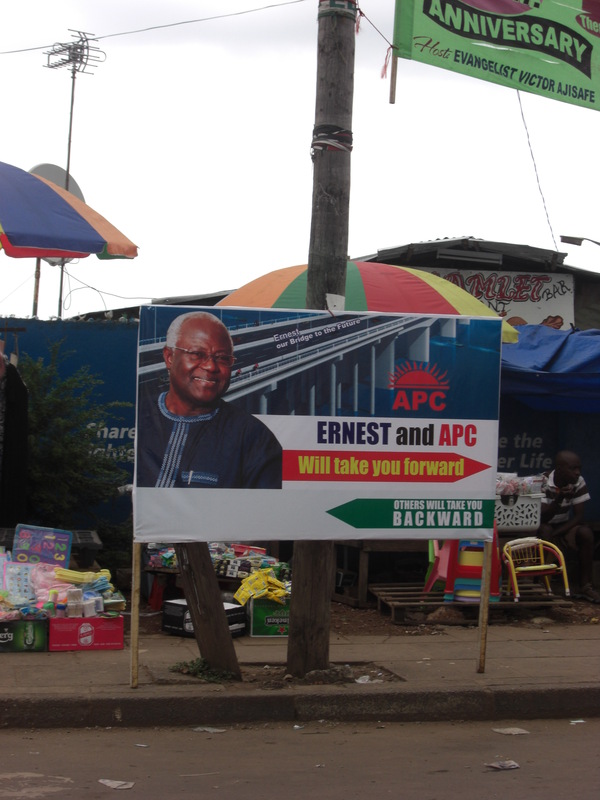 APC has delivered in the past, and to many Sierra Leoneans seem more likely to continue to do so in the future. The result of this, however , is that while Sierra Leone may be anchoring their democracy with continued elections (this is the third one after the end of the civil war), they are also moving toward a more limited political party system. The smaller political opposition parties are marginalized further and the political system becomes more and more dominated by only two parties, the APC and SLPP. While waiting for the NEC announcement, which will determine whether the country moves to a second round of presidential elections, or if one party has enough votes to capture the biggest prize – the presidency – SLPP supporters and party officials are crying fraud. Many of them are expecting, or rather hoping for a runoff, although at the moment such an outcome seems unlikely. Such statements from the opposition are understandable in a situation where they stand to lose a lot. At the same time, it raises concerns for outbreaks of violence in the aftermath of an announcement from NEC. 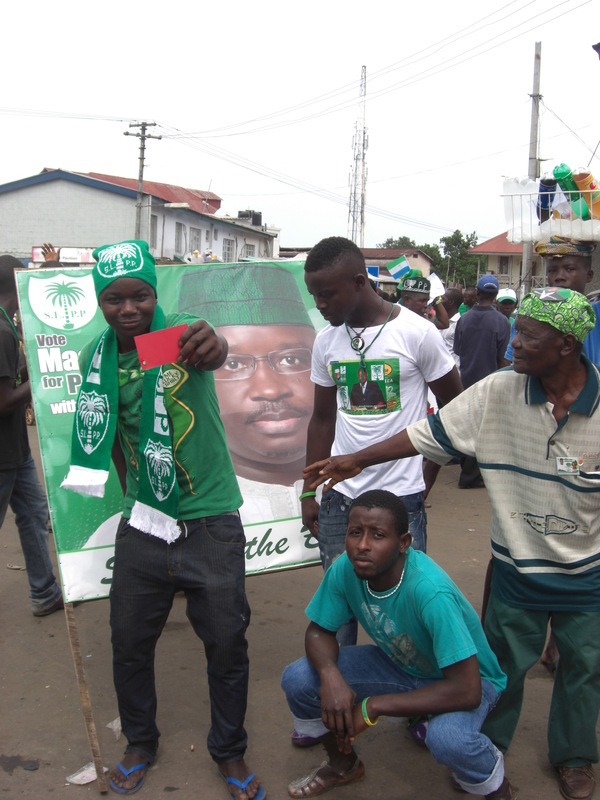 Many voters, however, are hoping that Sierra Leone has moved beyond the kind of electoral violence that characterized the last election in 2007, and are frustrated that efforts to dampen such political fever may prove fruitless in the end. Others seem to care less about the final result, and would rather have it all be done and over with, so that someone, either APC or SLPP can get on with moving the country forward, continuing to build roads and extending the electricity grid, or improving health care. As noted by one young man: “Let’s get it over with, and continue with more important things. So much that needs to be done in this country.” But the waiting game continues. At the same time, life continues all over Freetown. Street vendors continue with business as usual, children play on the streets, cars competing to maneuver potholes and make their way the fastest to their destination. Footballs are kicked around wherever there is some unused space, and others are simply waiting for work, for something to do. Johanna Söderström is a researcher at the Nordic Africa Institute. She is part of the project Between Big Man Politics and Democratisation: Local Perceptions and Individual Agency in Processes of Electoral Violence. She is currently in Freetown covering the elections. This entry was posted in Elections and tagged Sierra Leone. Bookmark the permalink.